Shazam: [can't hear him] Wait, WHAT? Shazam: Are you making some, like, big, evil-guy speech right now or somethin'? You're like a mile away from me, and there's traffic and cars and stuff! All I see is mouth-movin'! Shazam: Ah, whatever, screw it! Q: Why not call the movie Captain Marvel? Shazam! 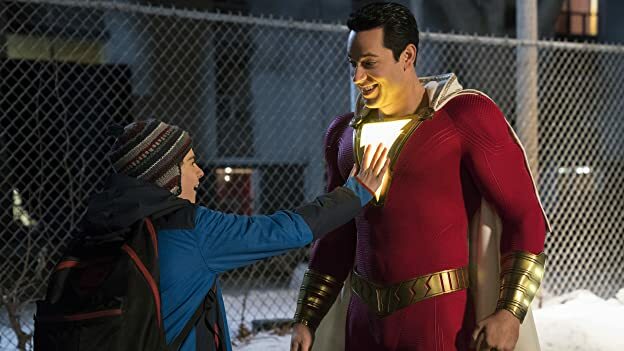 is directed by David F. Sanberg (Lights Out, Annabelle: Creation), written by Henry Gayden (Earth to Echo) and stars Zachary Levi as Billy Batson/Shazam. The film follows 14-year-old Billy Batson, an orphan boy who keeps running from foster homes. 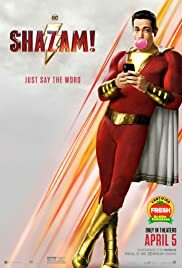 When he gets adopted by a couple who share a home with many foster kids, Billy is soon granted magical, wizard powers, and discovers that when he says the wizard's name, Shazam, he turns into an adult male with super-hero like abilities. The DCEU isn't much of a franchise at this point. Aquaman was so separated from other films in the franchise, it's essentially its own thing. Shazam! follows suit. While there are references to Superman, Batman, and other Justice League heroes throughout, the film isn't concerned with connecting dots or setting up a franchise. It tries to be its own thing. 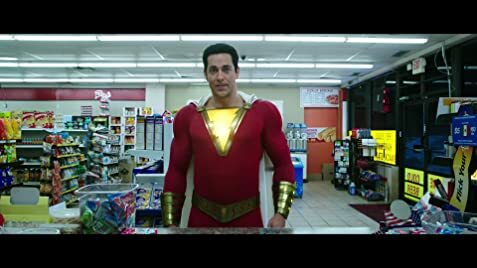 The strongest aspect of this film by far is Zachary Levi. A ravingly underrated actor, Levi brings this film the energy, charm, and humor it needs. He plays the role of a teenage boy stuck in a man's body not only well, but eerily convincingly so. Jack Dylan Grazer, who plays Billy's foster brother Freddy, is also great. Neurotic and hilarious, he helps further convince you of this film's ridiculous premise. Asher Angel, who plays young Billy Batson, got the short end of the stick here, as he's given a character who hides his emotions. So while he still feels like Billy, he's the less entertaining half of Billy. Nonetheless, he delivers a great performance, and the film lands because of him. The rest of the cast is alright, with some weak performances and a decent one from Mark Strong. The script is another strength here. 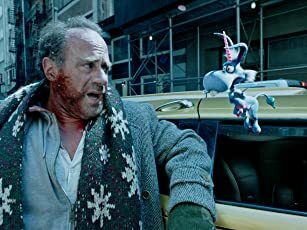 It balances humor and drama, horror and light-heartedness, and character and spectacle better than any DCEU film so far. I cared about these characters. I understood their motivations and their desires. The film is a character piece more than a super-hero film, though. The story isn't about a boy who turns into an adult super-hero battling evil, it's about a boy learning to grow up and accept the things he's ignored his whole life. Billy must realize he must pursue what he needs, not what he wants, and he comes to understand that everything he believed to be true is wrong. It's fantastic, and it's what makes the entire third act land. This movie is self-aware. It carries a plethora of tongue-in-cheek references, and never forgets to make you laugh. The humor is natural, fresh, and never undermines the dramatic tension of the film. Sanberg's direction is strong here. There are definitely some horror-tinged sequences. I'll have to see it a second time to really analyze how this film was shot, but if I remember correctly, it rarely goes large. The movie doesn't try to be a spectacle, and instead simmers down and remains small unlike it's hero. The score is great. The soundtrack is amazing. I had some genuine laughs. While the film is definitely one set piece too long, and could have been tightened down in its third act, I don't have many complaints outside of that. It also brings its own spin to the super-hero genre. This is definitely a family super-hero film. I would argue it's even more of a family super-hero film than The Incredibles. And aside from some mild language and a couple scary scenes (it earns it's PG-13 rating), it's one of the more wholesome super-hero movies to come along in a while. I loved this film. Everybody here knocked it out of the park. It has heart and humor and a great message. Hands down the best DCEU film. I can't wait to see what they do with the future movies. So far, it's my favorite film of the year. 103 of 183 people found this review helpful. Was this review helpful to you?